A lot of my work advising SaaS companies as they start to scale centers around sales capacity optimization. Everything from big-picture decisions like the perfect job description for senior sales leaders to more tactical questions like where the online sales team should sit on the org chart. A key question that every growing company asks during annual planning is: “How many sales reps do we need today?” That answer can get complicated fast when you start factoring in how much customer education it takes to sell your product, what market segments you’re targeting, your pricing and pricing model, and so on. The good news is that I’ve observed a reliable way to get most of the way to an actionable answer to the sales capacity question. I call this calculation the “tooth-to-tail ratio”. It takes just two headcount data points to calculate yet its validity is supported by performance data at several of the highest-growth early-stage SaaS companies in ScaleVP’s portfolio. As I said, quick and reliable. And when you’re just starting to ramp sales, you’re probably looking for all the quick and reliable insight you can get. The term “tooth-to-tail” takes its inspiration from one method the U.S. military uses to measure combat readiness and efficiency. In the SaaS context, we’re 10,000 feet above sales efficiency metrics like the Magic Number. Tooth-to-tail gets you started -- especially in the earliest stages of your sales ramp -- figuring out how many reps you need to achieve growth targets. Every sales leader knows the struggle to optimize sales capacity. Too few salespeople and you miss opportunities or, worse, cede territory to the competition during the the early-market land grab. Too many, and morale suffers as your reps compete with each other, straining performance and crushing your Magic Number. There are any number of methods sales leaders can use to link sales targets with the size of the sales force. A bottom-up approach multiplies quota bearing sales reps (QBSRs) by their quotas to arrive at a projection. A top-down approach starts from your company’s revenue targets and works backwards through individual quotas and productivity metrics to arrive at a target number of QBSRs. But we all know the results of these approaches have varying degrees of accuracy, and the reality ends up being a lot of push and pull to keep capacity properly aligned with growth goals. Sales efficiency metrics like the Magic Number are incredibly insightful and suited for measuring the unique sales and marketing dynamics of the SaaS world. In fact, our Magic Number calculator remains one of our most-visited articles. But sales and marketing expense as a percentage of revenue doesn’t sufficiently isolate the contribution of sales in a way that helps right-size selling capacity. Which brings us to tooth-to-tail: a quick calculation that gives you insight into how much you are investing in sales reps relative to the headcount size of the overall organization. The term’s military usage is straightforward: a “tooth” is a combat unit whose effectiveness is linked to a “tail” of logistics, intelligence, and other support personnel. In this context, a high tooth-to-tail ratio indicates both greater combat capacity and overall efficiency. Applying the concept to optimizing SaaS sales capacity is where it gets interesting. Here, the “tooth” is the total headcount of your company’s QBSRs, while the “tail” is simply the entire remaining headcount of the company. That’s an important distinction from the military usage. You don’t need to make judgement calls about which non-QBSR employees “support” sales. The idea is simply to measure the ratio of sales to everyone else. As you’ll see, it gives you not only moment-in-time insight but also a single, easily measured datapoint to align overall staffing and investment over time. So what number do you want to see there? Let’s look at the data behind the concept. Using tooth-to-tail in a sales setting wouldn’t be much more than a curious idea if it weren’t for the the data backing up its relevance. We find that companies not growing fast enough tend to have lower tooth-to-tail ratios: not enough capacity, not enough sales. The sweet spot, defined by the highest-performance early-growth SaaS companies in our dataset, is right around 20%, with an optimal range of 15% to 21%. Here’s what the underlying data looks like. We used a random set of 18 SaaS companies during the period their ARR was under $10MM. The y-axis shows growth as measured by iCAGR, ScaleVP’s preferred method for capturing a reliable snapshot of SaaS company growth at a given point in time. The x-axis shows the tooth-to-tail ratio of each company at that point in time. The trend is pretty clear: the fastest growers (top quartile) had a median growth rate of 209.28% associated with a median tooth-to-tail of 21%. The second growth-rate quartile had median iCAGR of 142.9% and a tooth-to-tail of 11%. Overall fit was an R2 of 0.69. Clearly this is a small set of companies, but I wanted to capture that key period in time after a company achieves product-market fit and is still learning to scale its business -- and its sales practices in particular. A low tooth-to-tail (≤10%) implies that the company is over-indexed in non-revenue-generating categories. A reading ≥21% likely indicates a company with excess sales capacity, flagging sales efficiency, and not enough resources dedicated to building and supporting the product itself. Big picture: Too low and you jeopardize your ability to meet revenue targets; too high and you risk underinvesting in engineering and marketing a product customers actually care about. A low tooth-to-tail should prompt you to turn to other metrics for insight. If your churn is too high, for instance, your sales are probably outpacing product development. Sales and marketing are performing but your product isn’t solving the problems customers are coming to you to solve. At the end of the day, tooth-to-tail is a useful rule of thumb backed up by strong correlation data. But every SaaS company is different and every sales organization unique, even before allowing for their varying needs at different stages of growth. 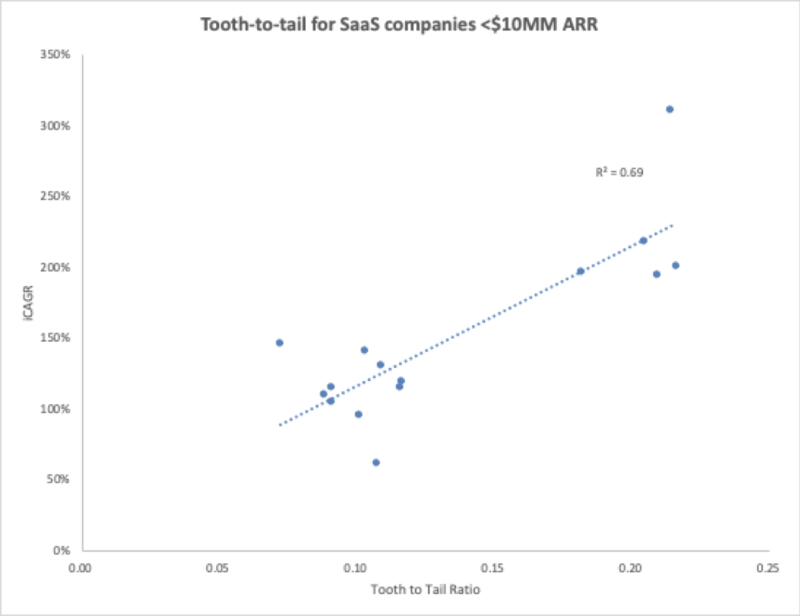 Given the quick and easy calculation involved, tooth-to-tail is a useful check-in metric that can be combined with other analytics to help troublespot and, ultimately, make better decisions. The implication is that maintaining a stable tooth-to-tail involves coordinating sales hiring with overall headcount growth. Intuitively, that makes sense: as employees company-wide contribute to the development of the organization, your sales force needs to maintain its capacity to generate top-line growth.